Enjoy Tic Tac Toe with our Sidewalk Chalk animated theme. 3 modes of play (easy, medium, hard) so you can adjust it to your desire! Play against the computer or against another person in 2 player mode! Sidewalk Chalk is a beautiful, relaxing theme with simple chalk drawings of the X and Os. ★ 3 levels of play when playing against the computer. ★ Play against the computer or against another person in 2 player mode. ★ Fun animations during gameplay. 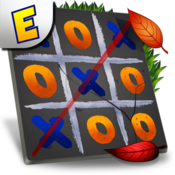 We hope you enjoy Terrific Tic Tac Toe Free! You can get the full version of Terrific Tic Tac which has 2 additional themes and lots of fun music.